Well, I got to complete only one LO this week. But one is better than none and I really like it, so add bonus points! A lot of thought went into this LO. Sometimes when that happens, I over think and get lost, but not this time. I had a clear vision in my head, I stuck to the general idea, but embellished it a little...haha I crack myself up. 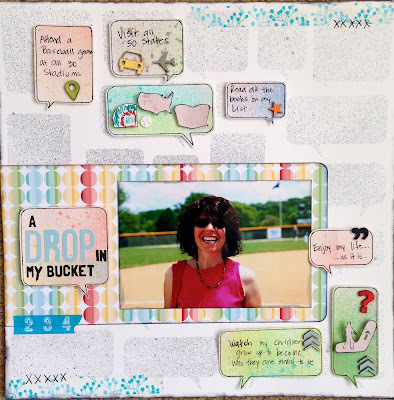 The inspiration for the idea comes from Another Freaking Scrappy Challenge---Bucket Lists. I've been wanting to play along there since they started about a year ago. I keep looking at their challenges, but just haven't played along. Seeing as this is my month of challenge blogs, it's time to give them a whirl. Some of the design ideas came from Club CK Issue Challenge #3, Get messy with paints, inks, sprays etc...I also was intrigued by the current challenge at Frosted Designs, Up, up and away. I wrote down a list of things to put into my "bucket" last summer, but never created a page about it. This was the perfect opportunity. I grabbed this photo of me taken on my 40th birthday. (Appropriate yes?) I wanted to use some new paper and this stencil, so I decided to make the speech bubbles the place to write some of the things on my list. I misted the background as well as tracing some of the bubbles, cutting them out, them misting them in multiple colors that worked with the paper. When I adhered the speech bubbles, I put them slightly off the ones underneath so you could still see the misted background ones. I added wood veneers that work with each item on my list and used ink pads to color them. I purposely left one bubble in each cluster blank so I could use embellishments to enhance the theme. The person on the escalator and chevrons pointing up are my interpretation of Up, up and away. They play off my thoughts about my children growing up. Adding the tape at the top and bottom gave me a chance to complement the color blue in the title and add the faux stitching does the same. Thanks for all the inspiration. This turned out to be a fun LO to out together. What a great idea for a layout! Love the offset speech bubbles and the little wooden accents! Thanks for joining us at Frosted Designs. Such a creative layout! Love the speech bubbles and wood accents! Thanks for joining us at Frosted Designs! Devra - this is such a fun and imaginative design - great work! Thanks so much for playing along with Another Freaking Scrappy Challenge - hope to see you here again soon!!! Love your page! Great colors and love the word bubles! Thanks for joining us at AFSC!